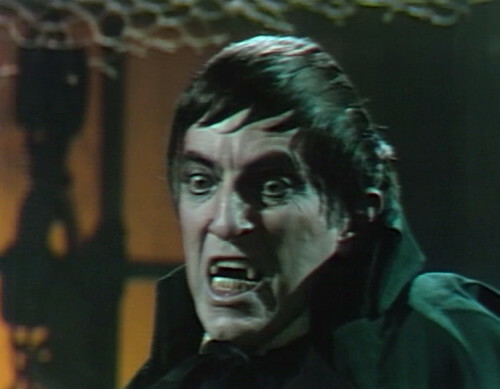 X5: Why Did Barnabas Sell Fangs for a Dollar? I’m away this week, because I need to spend some time standing in a cemetery and yelling at Julia to hear my voice, which is echoing through the centuries. But I don’t want to leave you with nothing to do just because I’m off time traveling, so here’s the final day of extracts from Paperback Library’s death-defying attempt to write 91 pages of vampire jokes without the use of a sense of humor. 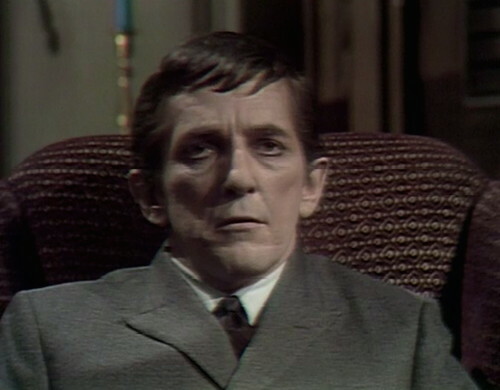 So far, we’ve seen the compilers of Barnabas Collins In a Funny Vein discuss Barnabas’ favorite song, film, coffee, dessert, President, fictional character and Chinaman. Today, we’re going to go deep into the matrix, and check out the jokes that I find utterly baffling. Like, the “I don’t understand how they’re even jokes” kind of baffling. For example: Take a moment to prepare yourself for the following joke. Where do Barnabas’ victims live? They live in a cemetery. I mean, you have to watch yourself around a joke like that. That is for trained professionals only. But there’s more, so many more. These are jokes where you have to just step back and reflect on the choices you’ve made that led you to this moment. Barnabas is 175 years old. Does he come from a family of long livers? Yes, certainly. He had an uncle who had a liver that was ten inches long. What does Barnabas think of a manicure? Why does Barnabas think frogs should eat toadstools? Because that would make them croak. What kinds of photographs does Barnabas take of his girl friends? What kind of cycle does Barnabas have? What did Barnabas say about the redhead he froze in his freezer? He plans to unfreeze her and call her his thrawberry blonde. There are some where I think they’re trying to make a pun, but I don’t know why the word they’re focusing on is relevant to Barnabas. Yes, but he drinks only rubbing alcohol. Has Barnabas gone into another business on the side? Yes, he opened up a plant to produce frozen gastric juice. Yes. He wrestles scratch-as-scratch can. What part would Barnabas like to play? He would like to be King Leer. Does Barnabas have a garden? No, but he does a lot of digging. What type of table does Barnabas like to eat off of? He likes to eat off of a lament table. Does Barnabas ever do any writing? Yes, he does a lot of scrawling. In fact, when he writes he scrawls out from under a rock. Why does Barnabas throw moth crystals at people in coffins? So the moths won’t eat their burial clothes. What kind of dog does Barnabas have? Barnabas is really old-fashioned. He doesn’t use a belt. And he even uses suspenders to hold up his cape. 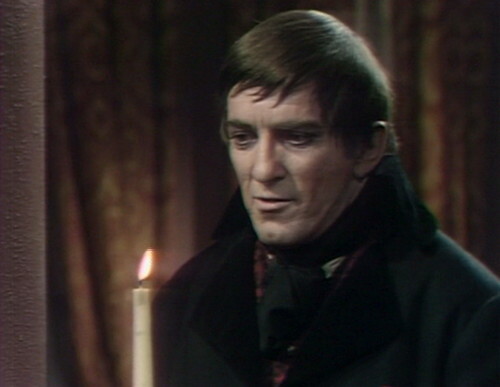 How does Barnabas scare his children? He tells them that if they aren’t good, the hobgoblins will get them. I visited the hospital to see a friend, a witch who was hurt in an accident. She flew off the handle. The woman said hospital costs were so high, she had to sell her blood to pay the bill. Why doesn’t Barnabas drink much snake milk? Because he has to lean over so far to milk snakes that it makes his back sore. Why are Barnabas’ victims always barefooted? He always makes them take off their shoes so they won’t hurt their feet when they kick the bucket. Do his girl friends call him “Hun”? Yes, they call him “Hun” — “Attilla the Hun”. Barnabas has a ranch and his brand is an eight with a circle around it. The name of the brand is the “Circle-eight”. What did Barnabas order for lunch on September 23? He ordered lobster claws and let them bite him. You’ve heard of Cyrus McCormick? He invented the reaper. 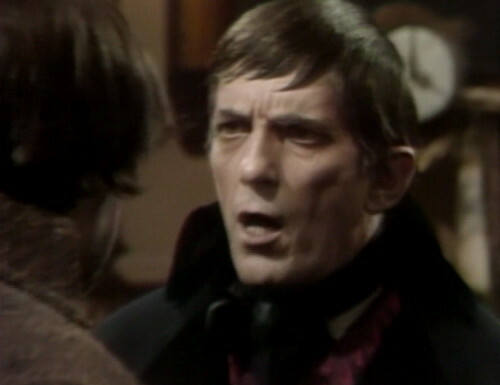 Well, Barnabas is a sort of Virus McCormick. He invented the grim reaper. Why did Barnabas sell fangs for a dollar? So people could have buck teeth. And there are some where I literally do not understand what they’re trying to say. Does Barnabas play any sports? Well, if we don’t stop him, he’ll have his own National Open. What does Barnabas think about the organizations who want to freeze people and bring them back to life in a few years? What does Barnabas think about people having their faces lifted? He thinks they would do better to have them lowered. Among Barnabas’ favorite organs is the mouth organ. Last time I visited my dentist, he said my fangs were in good shape but my gums would have to come out. Did you hear about Barnabas getting his wrists pierced? Now he can wear cuff links in the summer when he is wearing short sleeves. Why do submarines have screen doors? To keep the flies in. 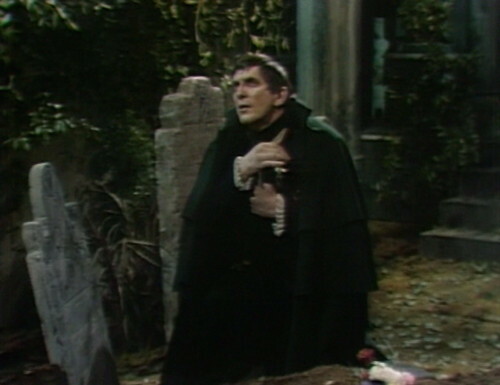 Barnabas says: You show me a trunk murderer and I’ll show you a messy packer. Why did Barnabas get thrown out of the navy? He tattooed a chest on his ship. Okay, sure. Those are things that somebody printed in a book and distributed to children. At a certain point, you just accept that Barnabas’ sheets are made of Satan, and then you move on. But there’s something interesting here about Dark Shadows, or at least the way that it was experienced by the original audience. In 1969, Dark Shadows isn’t just a five-year story about the Collins family. It’s not even a TV show, really — it’s something bigger and messier, something that pops out at you everywhere you look. Dark Shadows is hit records, and View-Master reels. Dark Shadows is trading cards, and “win a date with Jonathan Frid” contests, and $1,500 worth of shrubbery damage in Fort Wayne. 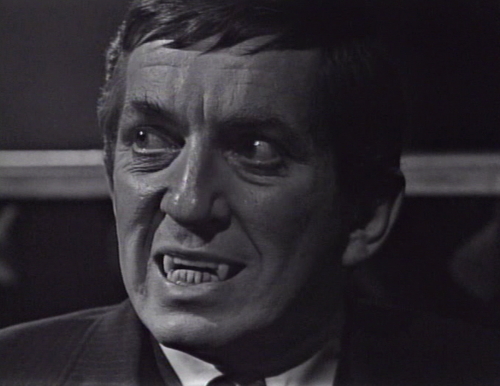 Dark Shadows is pop culture, red in tooth and claw. 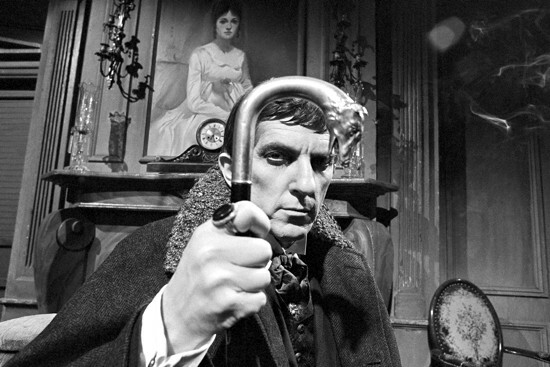 If you accept the blithering nonsense that you see on the TV screen, then the blithering nonsense of Barnabas Collins In a Funny Vein comes along for the ride. 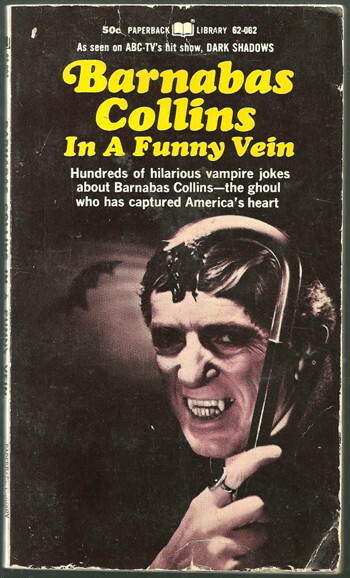 In that spirit, I would like to encourage you to love Barnabas Collins In a Funny Vein. I know that it’s not easy. Nothing worthwhile ever is. As a final send-off, here’s the joke I’ve been saving up all week — the single most brain-scrambling joke that has ever been written. I hear that Barnabas comes from Wales. What about it? Sure did. But you spelled it wrong. He came from a whale. Monday: The Case of the Lifted Ledger. Suddenly, all of the harpoons on Collinsport walls make sense. I think the submarine joke may be my favorite. Not only as baffling nonsense, but since they just gave up trying to explain that, say, Barnabas really likes to take submarine voyages when he’s not sleeping on Satan or at the blood bank. That last joke will give Vicki something to think about as she stares off into space and we hear the sad woodwinds. The perfect finale to a perfect week. This gravedigger has just finished filling in a grave, and is patting the soil on top with the back of his shovel to even out his handiwork, when along comes Barnabas who is merely passing by and who also happens to be carrying a shovel. One of jokes that didn’t make it into the book because it actually makes sense. Eventually the book just becomes a William Burroughs cut-up of every other Halloween joke book. First they stretched comedy to the breaking point, and THEN they did this book. Ouch, that was painful and gruesome, but we’ve been caught being very, very naughty indeed, and probably deserved it. I laughed, I died. Only took about a minute. Thanks a bunch. Now everything will be ghostwritten. Hmmm. Is it possible they hired the TURN ON writers to do this book? It would explain a lot (including the odd Chinaman and rabbi jokes). Stop it. Danny, stop this right now! I stopped reading after the puns that don’t make sense… If I read any more, I will go mad. It’s like one of those freakish dreams right before you turn into a Leviathan. 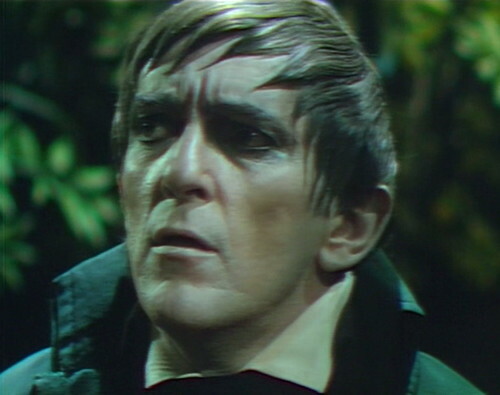 Maybe the last joke should be Barnabas likes to visit the “Blue Whale” (and not Wales) – or something like that. Right now, all sensible fans should report to their nearest, or most favorite, graveyard and join us in psychically willing Danny’s safe and sudden return from the nebulous nether world of Wouldn’t You Like To know. Phyllis Diller was one of the great comediennes of the late 60’s TV scene, and she often talked about her husband, Fang, but we never see Fang. I thought that might get mentioned in the book, but I guess not. Maybe she was married to Barnabas? I’m imagining a Parallel Time, where Phyllis Diller is Angelique’s pesky, annoying aunt witch, who has plenty of magic power of her own. She drives Angelique nuts and there’s not much she can do about it. Aunt Phyllis is always inviting gigolos, Dallesandros. maharajahs, elephants, pharmacists, mystics, nudists, weirdos and Timothy Leary, to “hang out” at Collinwood cause it’s really “freaky and far out”. Hilarity lurks just around the corner. It makes me wonder what would’ve happened if Barnabas had been chained in his coffin with only that book to read. He would have gone batty. Now let us never speak of BCIAFV again.